‘Goosebumps’ has been out for a few weeks now and I must confess I wasn’t particularly excited at the prospect of seeing it, largely due to the mediocre trailers that didn’t manage to successfully evoke the nostalgia for the book series. As it turns out, ‘Goosebumps’ is a lot better than I expected and it’s approach to R.L. Stine’s children’s horror series is smart, entertaining and fun. Instead of adapting one of the ‘Goosebumps’ novels like the TV series, the filmmakers approach is to encapsulate many of the stories through a narrative that feels a lot like ‘Jumanji’, with the various villains of the series coming to life when the original texts are opened. This approach works well, and with Slappy the Dummy (one of the creepiest villains for my money) leading the charge we’re on to a winner! The premise focuses on Zach (Dylan Minnette), a teenager who moves with his mum (Amy Ryan) from New York to Madison, Delaware. Early on, Zach meets his next door neighbour Hannah (Odeya Rush), who he is warned off by her father, a ‘Mr. Shivers’ (Jack Black). Needless to say some digging into Hannah and Mr. Shivers leads to Zach and his friend Champ (Ryan Lee) stumbling upon the ‘Goosebumps’ book collection and inadvertently releasing hell on the town. Dylan Minnette is very good as Zach, giving a better performance than I’d have expected based on his TV work, although I found Jack Black a little subdued and less enjoyable than he should have been in this kind of role. He’s better in his voice roles as Slappy and The Invisible Boy where he can utilise his full range to great effect. The film evokes nostalgia for a number of reasons, particularly the book series of course, but also the kind of kids horror comedies from the 80s like ‘Gremlins’, albeit not as good. The script gets a good balance between comedy, horror and it’s also surprisingly sweet at times and tugs on the heartstrings with a twist that works well even if it’s telegraphed significantly. Just like the books to an extent then, although the ending here is a lot better than most of the novels! 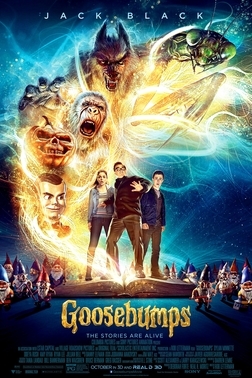 Overall I found ‘Goosebumps’ to be an enjoyable nostalgia trip with fun performances and an entertaining storyline with more depth than I’d have expected going in.